Olugbemisola Rhuday-Perkovich is, along with Audrey Vernick, the co-author of the middle-grade novels Two Naomis and Naomis Too, as well as the author of 8th Grade Superzero. 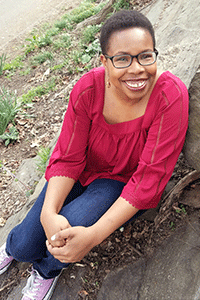 She has contributed to the website Brightly and the books Open Mic: Riffs on Life Between Cultures in Ten Voices and Break These Rules: 35 YA Authors on Speaking Up, Standing Out, and Being Yourself. Someday Is Now (ages 8-12): Someday Is Now tells the inspirational story of the celebrated civil rights leader, Clara Luper, who led one of the first lunch-counter sit-ins in America. As a child, Clara saw how segregation affected her life. Her journey famously led her to Oklahoma, where she and her students bravely desegregated stores and restaurants that were closed to African-Americans.